eMoviePoster has listed 999 French posters, consisting of 960 one-panels and 39 of other sizes, in their current Tuesday auction. These posters close on April 16 and can be viewed at www.emovieposter.com. One-panels are led by The Good, the Bad & the Ugly 1970s rerelease with Jean Mascii art, The Birds with Boris Grinsson art, Blow-Up 1969 rerelease, Dr. No 1970s rerelease, From Russia with Love 1970s rerelease, Gilda 1972 rerelease with art by Boris Grinsson, And God Created Woman 1964 reissue, Texas Chainsaw Massacre 1980s rerelease, and Foxy Brown. Thunderball 1980s rerelease, Bride of Frankenstein 2008 rerelease, Forced Vengeance, On Her Majesty’s Secret Service, Stalker, Dam Busters 1960s rerelease, Fists of Fury, Frankenstein 2008 rerelease, Drive, Creature from the Black Lagoon 2012 rerelease, Beneath the Planet of the Apes, Moonraker, and Pee-wee’s Big Adventure 2007 rerelease are offered. Additional one-panels include No Holds Barred, Casino Royale, Cannonball Run, Phantasm, Adventures of Buckaroo Banzai, Le Truc Du Bresilien style A, Buffalo ’66, Creepshow 2, Home Alone, Appaloosa, Inside Out advance, Once Upon a Time in the West 1970s rerelease, Blade Runner 2049 teaser, Amadeus, Showgirls, Around the World Under the Sea, and One That Got Away. Three surprising results from the auction that closed on April 9 were a Japanese 2001: A Space Odyssey 1995 foil reissue for $982, an Italian Shoeshine 1948 reissue one-sheet for $714, and British Dawn of the Dead quad for $492. 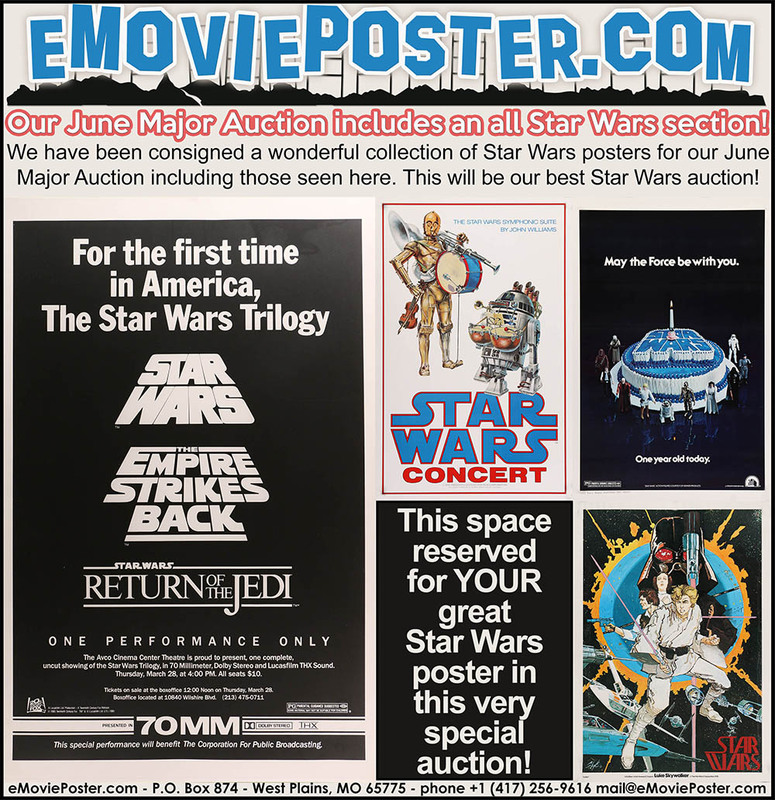 eMoviePoster doesn’t just auction U.S. and international movie posters. They also auction many tens of thousands of vintage stills, lobby cards, as well as scripts, all sorts of special non-movie posters (including lots of war and travel posters, plus Mondo signed limited editions), autographed items of every kind, and more. Their next all-signed item auction will be in mid-May. They add 3,000 unique new lots every week with 999 items in every Tuesday, Thursday, and Sunday auction – which has culminated to 1,560,000 items. They also hold a special giant auction of bulk lots once every month. Collectors interested in bidding with them can sign up on their Registration Page. Their next Major Auction is the June Major Auction, and they are taking consignments now. More details and some images of preview items are now available. This auction will contain a special all-Star Wars section, with lots of rarities.